An international team of 32 authors from 24 institutions in eight countries has just published a study titled "Greening of the Earth and its Drivers" in the journal Nature Climate Change showing significant greening of a quarter to one-half of the Earth's vegetated lands using data from the NASA-MODIS and NOAA-AVHRR satellite sensors of the past 33 years. The greening represents an increase in leaves on plants and trees. Green leaves produce sugars using energy in the sunlight to mix carbon dioxide (CO2) drawn in from the air with water and nutrients pumped in from the ground. These sugars are the source of food, fiber and fuel for life on Earth. More sugars are produced when there is more CO2 in the air, and this is called CO2 fertilization. "We were able to tie the greening largely to the fertilizing effect of rising atmospheric CO2 concentration by tasking several computer models to mimic plant growth observed in the satellite data," says co-author Prof. Ranga Myneni of the Department of Earth and Environment at Boston University, USA. Burning oil, gas, coal and wood for energy releases CO2 in to the air. The amount of CO2 in the air has been increasing since the industrial age and currently stands at a level not seen in at least half-a-million years. It is the chief culprit of climate change. 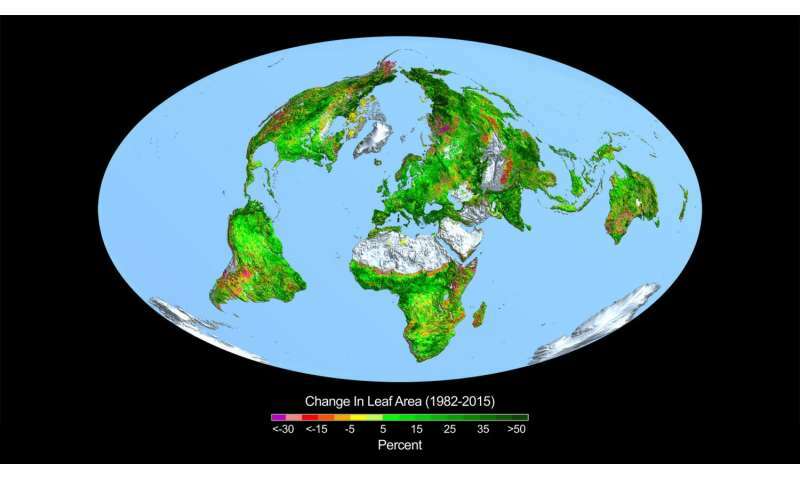 About 85% of the Earth's ice-free lands is covered by vegetation. The area of all green leaves on Earth is equal to, on average, 32% of the Earth's total surface area - oceans, lands and permanent icesheets combined. "The greening over the past 33 years reported in this study is equivalent to adding a green continent about two-times the size of mainland USA (18 million km2), and has the ability to fundamentally change the cycling of water and carbon in the climate system," says lead author Dr. Zaichun Zhu, a researcher from Peking University, China, who did the first-half of this study as a Visiting Scholar in the Department of Earth and Environment at Boston University, USA, together with Prof. Myneni. Every year, about one-half of the 10 billion tons of carbon emitted in to the atmosphere from human activities remains temporarily stored, in about equal parts, in the oceans and plants. "While our study did not address the connection between greening and carbon storage in plants, other studies have reported an increasing carbon sink on land since the 1980s, which is entirely consistent with the idea of a greening Earth," says coauthor Prof. Shilong Piao of the Chinese Academy of Sciences Center for Excellence in Tibetan Plateau Earth Science, Beijing, China. The beneficial aspect of CO2 fertilization in promoting plant growth has been used by contrarians, notably Lord Ridley (hereditary peer in the UK House of Lords) and Mr. Rupert Murdoch (owner of several news outlets), to argue against cuts in carbon emissions to mitigate climate change, similar to those agreed at the 21st Conference of Parties (COP) meeting in Paris last year under the UN Framework on Climate Change (UNFCCC). "The fallacy of the contrarian argument is two-fold. First, the many negative aspects of climate change, namely global warming, rising sea levels, melting glaciers and sea ice, more severe tropical storms, etc. are not acknowledged. Second, studies have shown that plants acclimatize, or adjust, to rising CO2 concentration and the fertilization effect diminishes over time," says co-author Dr. Philippe Ciais, Associate Director of the Laboratory of Climate and Environmental Sciences, Gif-suvYvette, France and Contributing Lead Author of the Carbon Chapter for the recent IPCC Assessment Report 5. CO2 fertilization is only one, albeit a predominant, reason why the Earth is greening. The study also identified climate change, nitrogen fertilization and land management as other important reasons. "While the detection of greening is based on measurements, the attribution to various drivers is based on models, and these models have known deficiencies. Future works will undoubtedly question and refine our results," says coauthor Dr. Josep Canadell of the CSIRO Oceans and Atmosphere Division in Canberra, Australia and leader of the Global Carbon Project. And still nothing about plant toxicity. Which is weird, right. I mean, it's not just me? I mean, it's not just me? It's just you and it may explain your stupidity. Who am I kidding, you were born that stupid. The predictions for hurricanes and cyclones were for LESS of larger MAGNITUDE. Are humans actually going to burn so much fuel life at the poles will be impossible for mammals? What is the upper limit for transpiration? What plant species can colonize spaces which humans cannot tolerate? "The fallacy of the contrarian argument is two-fold. First, the many negative aspects of climate change, namely global warming, rising sea levels, melting glaciers and sea ice, more severe tropical storms, etc. are not acknowledged. Second, studies have shown that plants acclimatize, or adjust, to rising CO2 concentration and the fertilization effect diminishes over time,"
Seems to me, the "many negatives aspects of climate change" have been over stated and exaggerated to Chicken Little proportions when compared to the evidence (as opposed to what the models that don't work say). Here we have evidence of more stuff growing, which, when applied to crops, is a good thing. CO2 after all, is food to plants. Which is one obvious benefit of using energy and CO2 emissions. Human population continues to burgeon out of control. Have you noticed more articles, TV shows, etc. about eating insects? They are softening us up, since that's the protein of choice in 2050. Don't have kids, so they won't be the generation that goes extinct (within 100 years, almost certainly, and unavoidably). Don't go prophet if you haven't prophet's abilities. It's a pity your parents did not heed such good advice. This article is another example of the reasons a crowdfunding campaign is underway on the Generosity crowdfunding site. The objective of the campaign is to sue the IPCC for fraud and stop the current climate change lunacy. The campaign is classified as "other" and called, "Save the World - Sue the IPCC"
Make those frauds at the IPCC pay! Every article on this site that presents data that mitigates the arguments of global warming advocates necessarily finishes up by offering a screed in favor of global warming. It's often not even a counterargument to the facts presented. It's just an editorial comment about how in spite of these facts global warming is really happening. Thus displaying the bias of the authors. This is supposed to be science writing, not cheerleading. While some plants are doing much better, and this is good, but another problem overlooked by the heightened CO2 problem is that it Also Decreases the free O2 (atmospheric Oxygen) levels at the same time. While this IS offset somewhat by the plants producing more by breaking down the CO2 we have, at the same time, been toxifying our oceans so that they do not produce near as much oxygen as they used to with huge DEAD zones showing up. It used to be taken for granted that there was plenty of plankton life to support the Atmospheric O2 levels, and that the amount of oxygen produced by plants on land was dwarfed by the ocean production. Now it is nowhere near as certain. With reduced O2 production on land and the Oceans being likewise impacted, we may have an Oxygen Deprivation problem before we have more problems associated to heating like flooding or plant diversity. O2 levels dropping below a point would remove most animals, including humans from the surface Very Quickly. Immeasurably sad to see the physics community promulgating what amounts to buttock-clenchingly awful pseudoscience at best and full-on voodoo witchcraft at worst. Good to see honest reporting of the inevitable effect of co2 fertilisation but bad to see the endless stern caveats from the howling insane climate catastrophe alarmists. And we STILL haven't seen any global rhetoric produced by IPCC and Al Gore for the dissemination of information world-wide for populations to quit polluting the air, soils and waters of Earth. Not even the usage of fossil fuels is mentioned to the general public in the media. It is as though the IPCC is fearful of straining the tolerance of the world's peoples for the concept of global warming that is purportedly caused by the activities of the world's peoples. IF the IPCC and their supporters weren't merely interested in the acquisition of monetary gain from developed nations, then WHAT have they done to entice the world's populations to avoid the pollution of our home planet?? We are still awaiting those full page ads and the admonishments through the media to that effect. What are you talking about? We've literally just come out of Cop21 - a UN sponsored summit to do exactly that? And it's not the first. And the UN has devoted 30 years to reducing pollution, encouraging nations to switch to renewables, phasing out CFCs, promoting environmental regulation and facilitating discussion between nations to counter climate change - while simultaneously conducting large-scale scientific meta-analysis to inform nations of the problem and of what they need to do to counter it. Seriously OS - what universe are you commenting from? And say hello to the #unicorns for me.